Yesterday afternoon I heard praying and singing coming from the girls' bedroom and found all seven of our children (ages 13 down to 1) playing "Mass!" My mom saw the picture above (posted from Instagram to Facebook) and called to ask if it had been staged. No, it was not staged! If it had been staged I would have given my oldest daughter a sweater to cover her shoulders, grabbed the girls' Mass veils from the van, and brushed everyones hair! ;) They did this completely on their own, without any encouragement or help from me. It brought tears to my eyes to see that this was the way the children had chosen to spend their afternoon, after I had asked the older ones to watch the little ones while I was busy catching up on some computer work and preparing to paint. 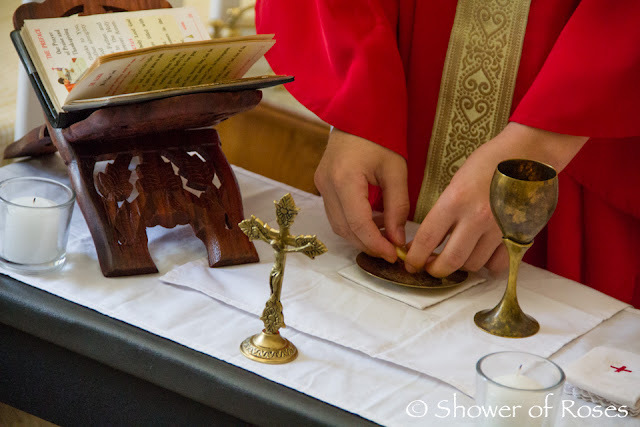 The Mass kits hadn't been pulled out much this year, but when I showed the pictures to my husband last night he pointed out that last weekend, while we were traveling, we had attended two very beautiful Masses (A Baptismal Mass on Saturday and a Solemn Pontifical Mass on Sunday that was part of the William Byrd Festival), in two gorgeous churches, celebrated by two different bishops. The beauty and reverence of the Masses did indeed inspire our children. After snapping that first picture (from the back of the "church" with my phone) I was asked to join them for the rest of Mass. I did, but first I ran to grab my camera. It was all so sweet! I sure wish I would have video recorded, especially a little of their singing before they knew I was listening... After that it wasn't quite as dramatic! The top bunk was used as a "Choir Loft" for the "Monk" who came down to chant the readings. We were out of Rice Crackers, but the kids found some leftover Banana Chips in the snack bag from our recent trip. He tried to escape during the recent baptism. "My dolly came to Mass too, 'cause we both made our First Holy Ta-mmunnions!" 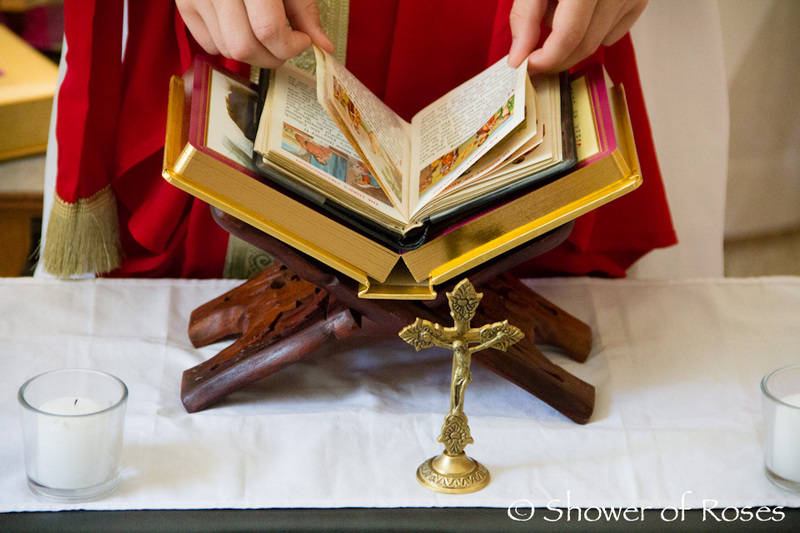 O Divine Jesus, Who has taught us to pray to the Lord of the harvest that He send forth laborers into His harvest, be pleased to raise up many holy Priests and religious to work according to the intentions of Your Heart and to procure by their ministry the salvation of souls and the glory of Your Father. 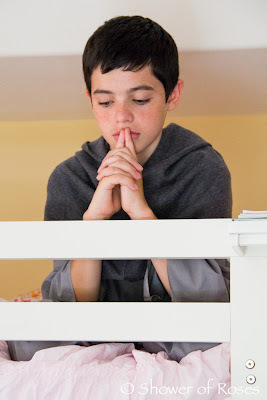 And if it should please You, O Lord to choose one such from our family kneeling before you at this moment, we thank You with all of our hearts on this earth and for all eternity. Mary, Mother of all Vocations, Pray for Us! Beautiful pictures, what a blessing! LOVED those special moments! Love! I hope my boys play this way someday. 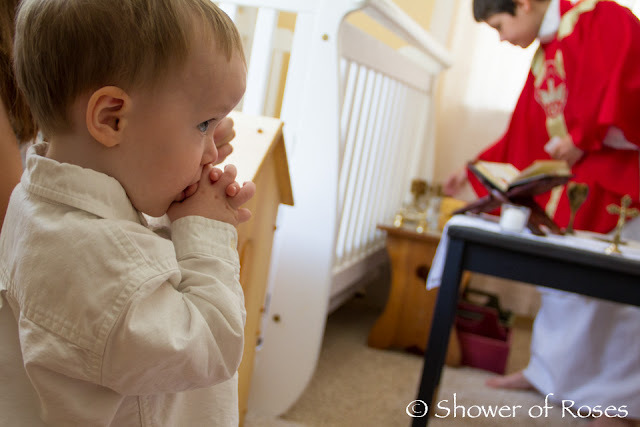 For now, I feel blessed that they are both eager to reach the age for first confession and Eucharist. 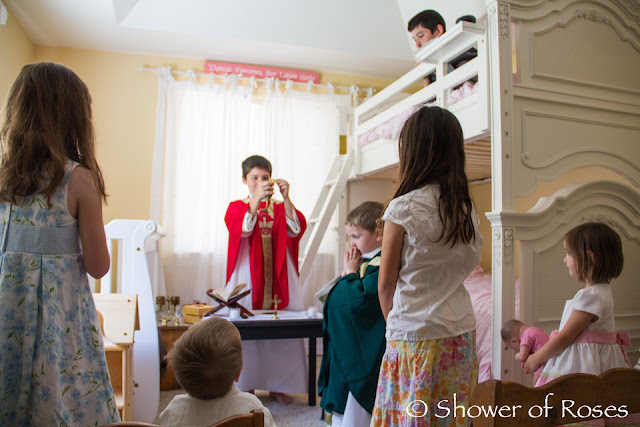 Clearly, Holy Mass gives joy to their youth! Beautiful pictures of such a beautiful family, Jessica! (and perhaps the Lord will call some of them to follow in their uncle Fathers' footsteps) AMDG! You have been truly blessed. Your family is a beautiful witness. So sweet and how special!! 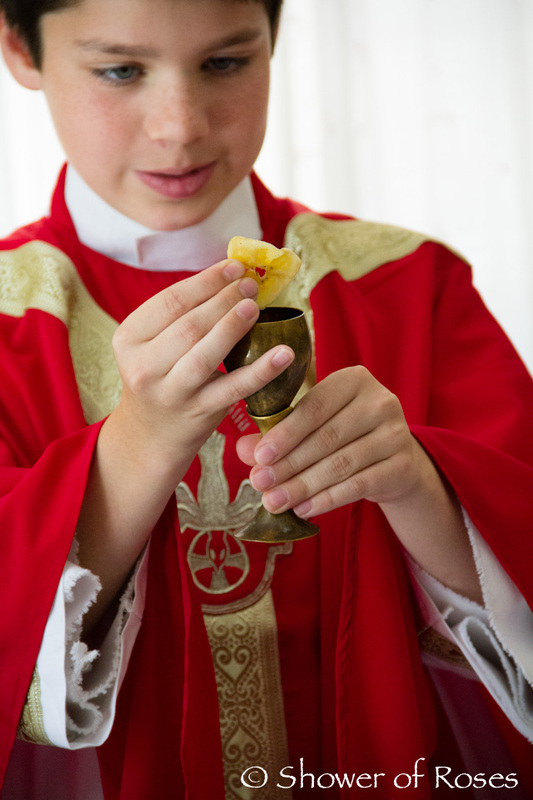 Rascal even holds the chalice so professionally! Will definitely be sharing this post with my boys!! God bless! I pray I can find a Latin mass here!! Precious! And so sweet that they all were playing this together! I love the dried banana chips in particular - great way to improvise! I love the way one year olds will copy and pray along with older siblings... my almost two year old now insists we all kneel when the rosaries come out after dinner each night! You should be so proud. This is just beautiful. God is smiling. Angels are singing. I'm so impressed! You're doing a wonderful job, Mommy! This is so sweet. Beautiful family. Beautiful! Thank you for sharing. I think your husband is absolutely correct. 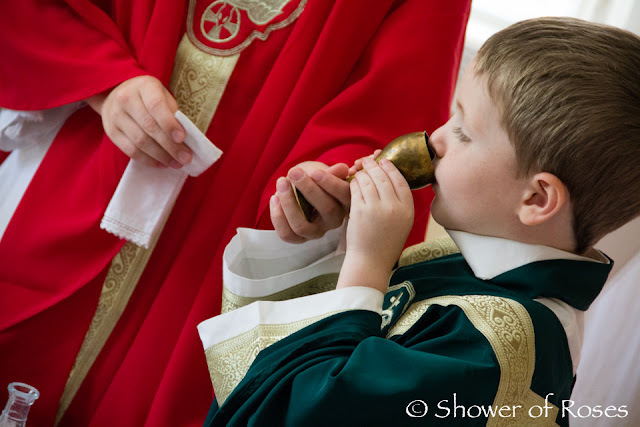 Let the wonder and beauty of the Mass be a lesson to all of us. 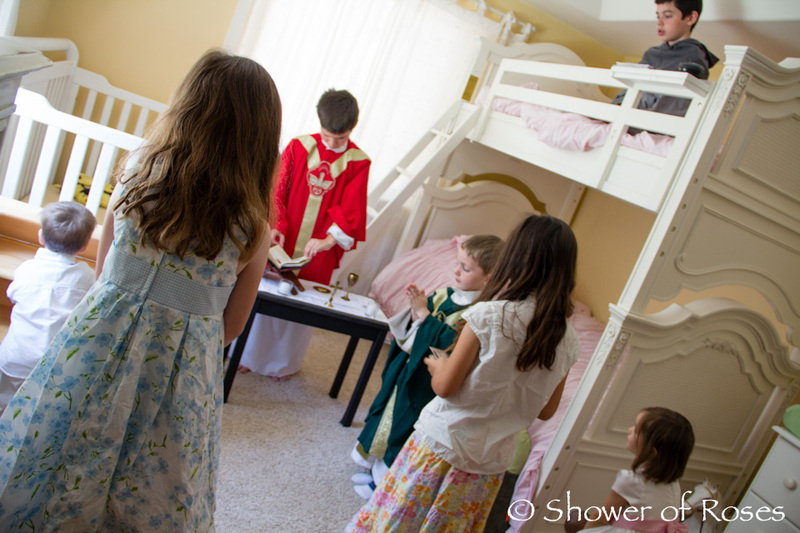 Children NEED these beautiful masses to inspire them. 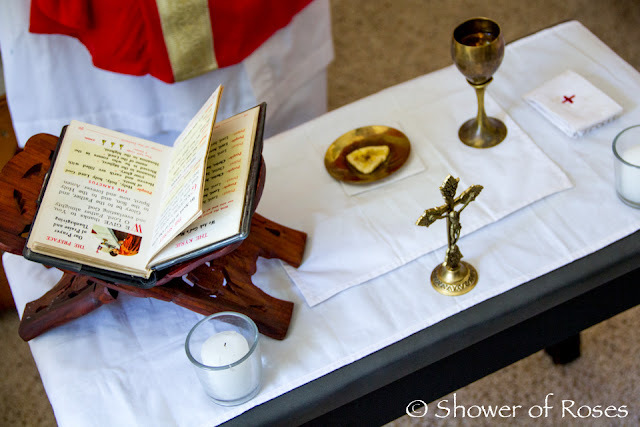 I believe these photos of your "beautiful mass" will inspire my children today. God bless you all. This brought tears to MY eyes, so I can't even imagine the way your heart felt to see this beautiful thing!! You are one blessed momma. What a blessing Jessica!!! I shared your post in my FB!!! We aren't Catholic, but we loved to play "church" when we were little! We were best friends with our minister's family, so they had everything needed at their house. This brought back sweet memories! This is lovely! Outside of the fact that they are playing Mass - which is beautiful - they are playing sweetly together - all of them. I might have to remember the TJ's banana chips for my CCD class. 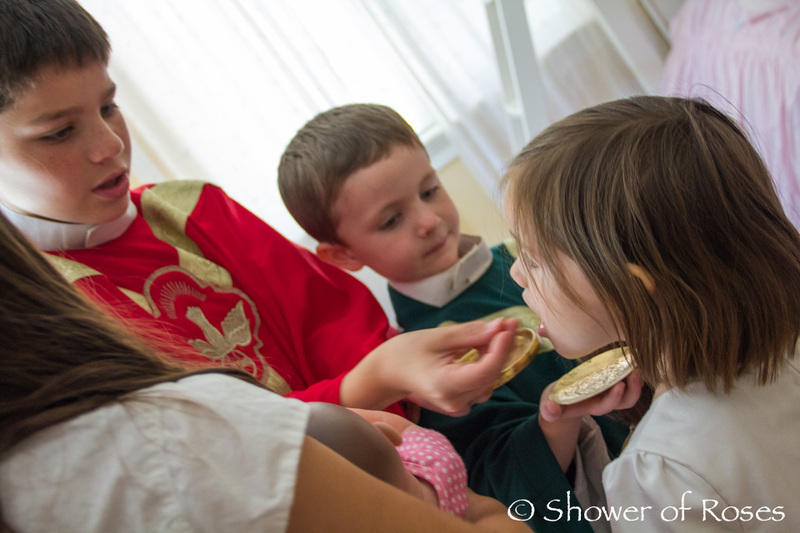 I am always trying to find something (low allergen) to teach the kids how to receive with. Sadly, most of my CCD kids come from families that aren't blessed with parents/families who bother to teach them so well that it even becomes their play! You are doing such a beautiful job. 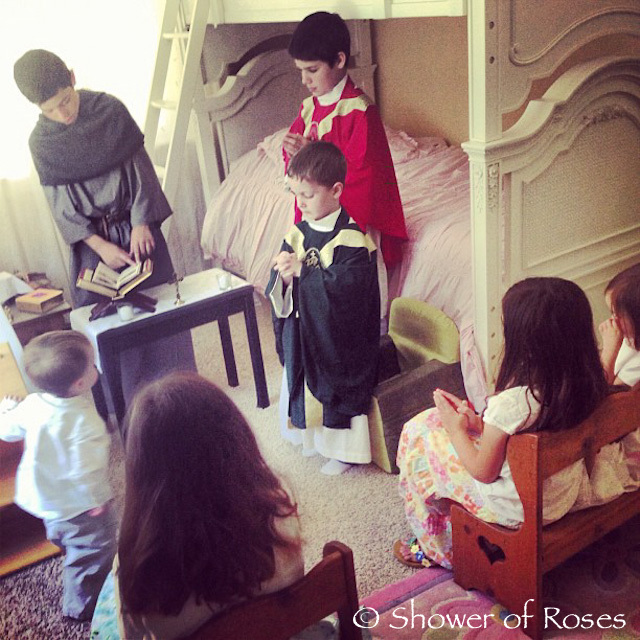 I love it when my kids play mass. It is so nice and refreshing to know they are paying attention! 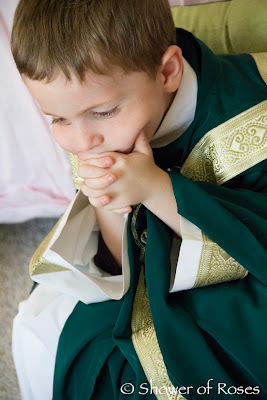 lol I have been wanitng to get that minuture mass set and those vestments are precious. Beautiful!!! God bless your family. Beautiful, thanks so much for sharing the pictures. 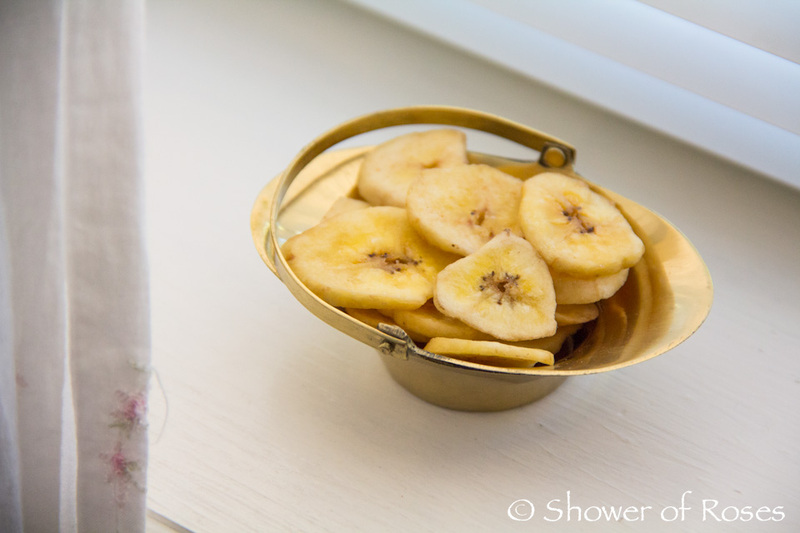 The banana chips are brilliant, what a good substitute for hosts!! I love this!! How beautiful! You're definitely making me hope for some sons added to our brood at some point in the future! Right now we just have two little "nuns" for the choir loft. ;-) Thanks for sharing! Absolutely lovely! It made me think "Awwww" when I saw the first picture. I love the banana chips! 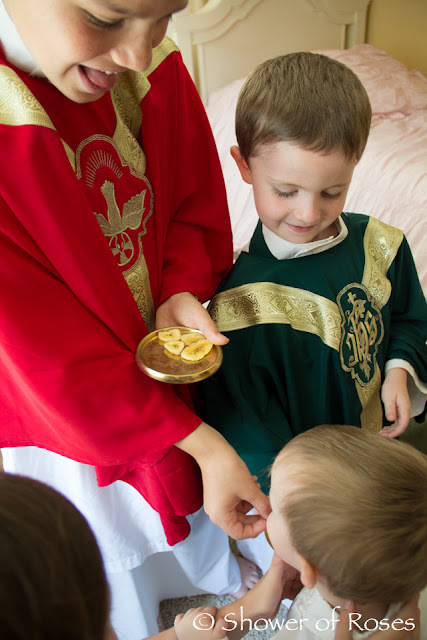 My son(s) also have a homemade Mass vestment and love to say Mass. 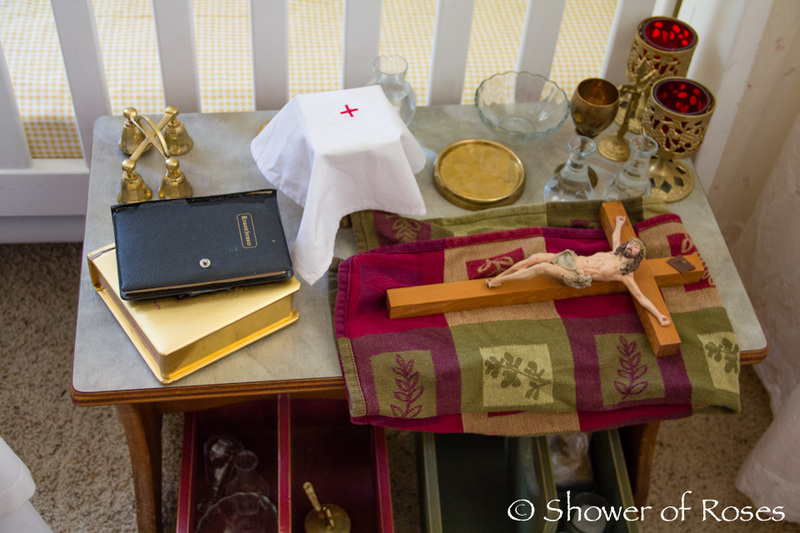 He was given unconsecrated hosts by his godmother to use during his play Masses, but he's run out. My kids get confused too when we visit your diocese, because in ours, we kneel after the Agnus Dei, thanks be to God! Thanks for sharing beautiful photos. 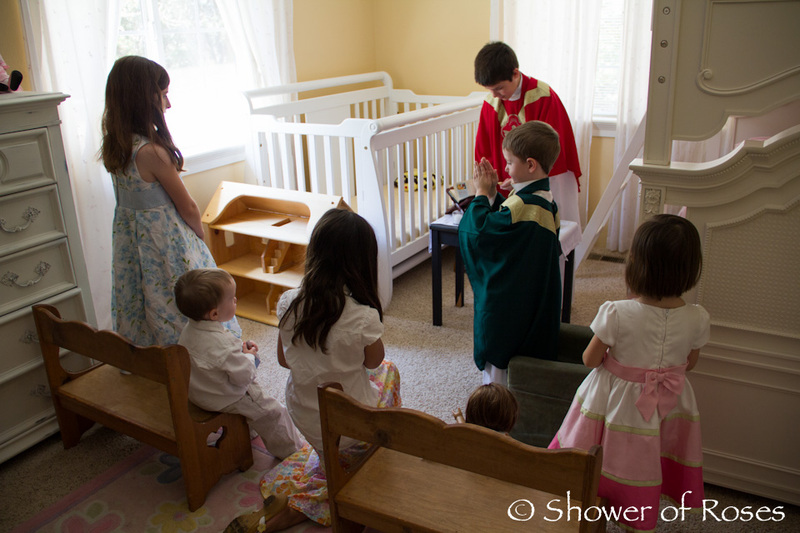 I wish all the Novus Ordo Mass postures were the same for the whole US. 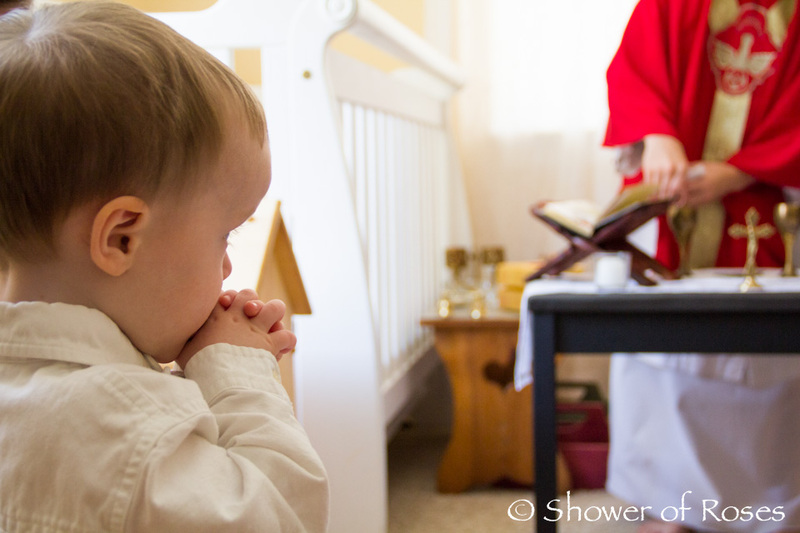 We kneel here after the Agnus Dei, but when we visit your diocese, my kids get confused too. 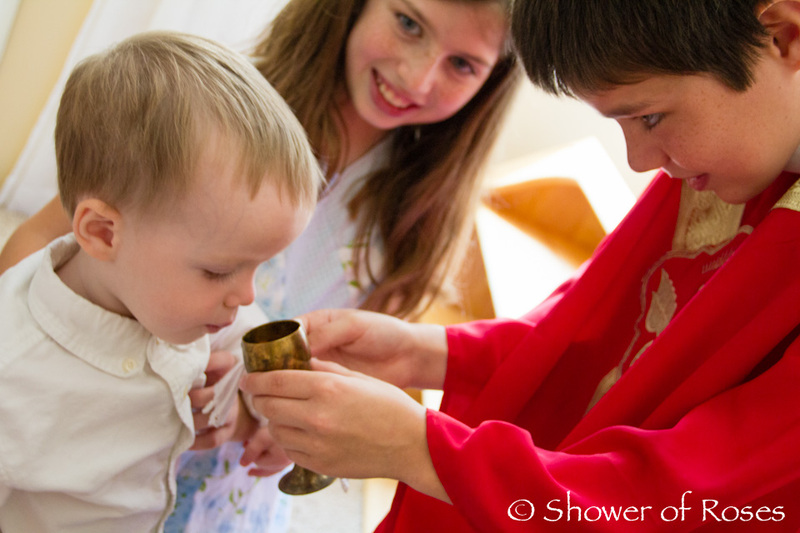 Your new archbishop is a wonderful treasure. Praying for him, and his Diocese! This is I think the best thing I have seen all week!! I LOVE how little Rose is holding a baby (doll)in her arms!! Too priceless, this tableau! So precious. 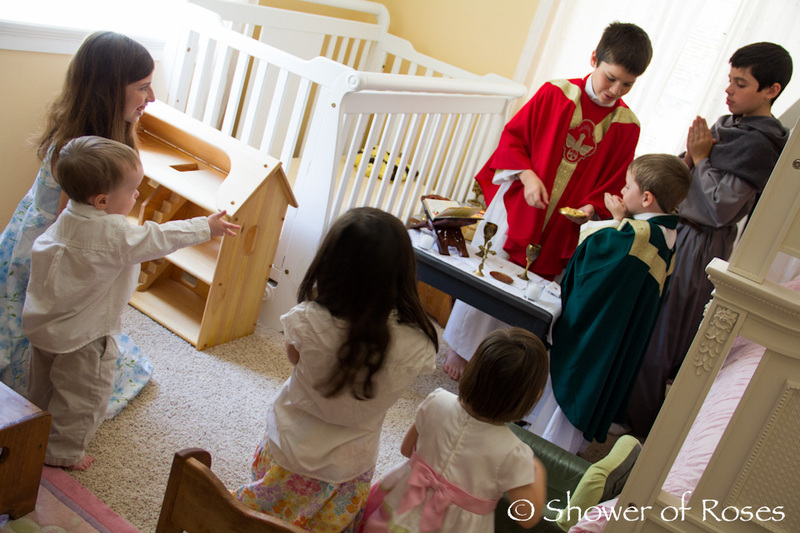 I used to play mass when I was a kid as well...and now I ended up in seminary. 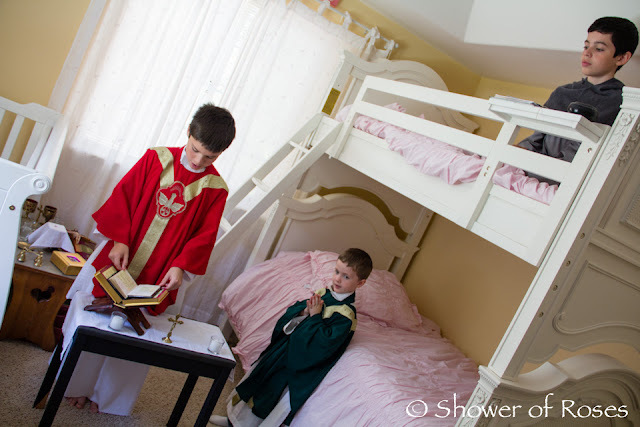 Perhaps you have a future priest in the family.